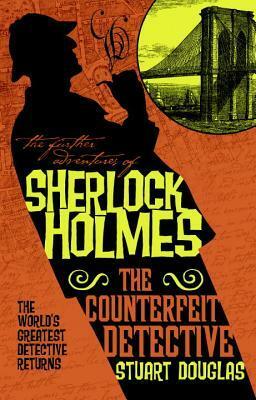 The Further Adventures of Sherlock Holmes: THE COUNTERFEIT DETECTIVE Review | Warped Factor - Words in the Key of Geek. The idea of Sherlock Holmes in New York City seems to be a popular one among those who write Holmes pastiches. As well as a number of novels and short stories (indeed, there's at least one volume dedicated to Holmes in America), there's also the 1970s TV movie starring none other than 007 actor Roger Moore as Holmes. Yet few, if any, have managed to come up with quite as original a take on the idea as Stuart Douglas in his pastiche The Counterfeit Detective, a recent entry in Titan Books' range The Further Adventures Of Sherlock Holmes. Douglas' premise is simple enough. As the title might imply, Holmes faces none other than an imposter claiming to be him running lose in the city that never sleeps. 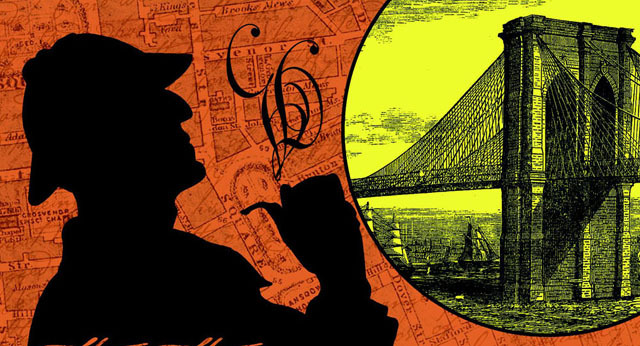 With Watson at his side, Holmes travels to New York City in 1899 and sets out trying to find his doppelganger. What looks to be a straightforward case turns out to be anything but as the tale takes in New York high society, the immigrant community, blackmail, and of course murder. Like any good mystery and thriller writer, Douglas takes in a series of apparently unconnected elements and weaves them together into a compelling narrative that never quite does what one expects it to do. A narrative that also feels like vintage Holmes. Set in 1899, the novel takes us from Holmes recovering in Baker Street from a series of assignments for his brother to the varying highs and lows of the Big Apple, all of which are described by Watson in fine detail. The standard by which I judge Holmes pastiches these days is if I can hear some of the great Holmes and Watson teams of screen and audio saying the words on the page and I have to say that this novel passed that test admirably. Watson gives the reader enough detail to makes Holmes' logic make sense and enough sketches of other characters to bring them to life. That's especially true of the many characters we encounter in New York City from Inspector Bullock to Mrs van Raalte, the Mrs Hudson to the impostor Holmes. All of which help to make the novel (which runs about 250 pages) into even more of a page turner. Despite a plethora of tales featuring Sherlock Holmes in New York, The Counterfeit Detective manages to raise its head above the pack. From a compelling narrative taking in the width and breadth of turn of the century New York to an authentic reading Holmes and Watson, Stuart Douglas creates a first rate Holmes pastiche that takes character and reader alike outside their usual comfort zone. The result makes for fine reading to say the least and something that many Holmes fans will likely enjoy immensely.